Hello everyone.My name is Yi yangqianxi,and I am from China. During the forum,I see some people are building better environments，some are researching medical miracles.I am very impressed. I think we are very lucky to be here…to be invited here to speak，and we speak not only for ourselves but also for child and teenagers who have difficultly participating fully in their society because of illnesses(or)lack of resources. I have been working with the World Health Organization in China since 2017 on promoting healthy lifestyle among young people. To build a healthier society,we need to start with our own personal action,make healthy choices,so that we will have future we dream of. As the same time,we can make an effort to reach out to those who need support，including children and teenagers. They are the building blocks of our future both for urban and rural areas. According to official date,there are almost 7 million left-behind children in rural china. Many of them are facing physical and mental health problems,along with other kind of problem in the daily lives. Our project“The Child Companion Plan”is trying hard to address these issues through the theme"one child,one family,one link". Our goal is giving all these children a better and healthier future. We must work together to make a difference and to achieve healthier,sustainable future. We have a phrase in china"Yi qi lai ba!". So I would like to ask all of you take action today,make it happen. Let's go!,"yi qi lai ba". Good afternoon,I’m Karry Wang from China. It is a great honor to be here with you today, and speak about the 17 sustainable development goals launched by the United Nations in 2015. These goals have become the beacon of national efforts all across the earth. Common concerns have been：One:how do we promote and achieve these goals. And Two:how do we better lead the public’s attention and participation. The fashion industry is crucial to achieving sustainable development goals. Every consumer’s choice in the fashion field has an impact on our future. Fashion is not something that is found in dress only. Fashion is in the sky,in the streets,in the mind. Fashion has to do with ideas. The way we live,the way we think,and what is happening around the world. It is closely related to every country and everyone. For example,we can save water by choosing natural pigments instead.And we can even make full use of recycled materialsto lead new fashion trends in our daily lives. If we can consciously change consumption behavior,and have sustainable lifestyles,then it’s new fashion. which I believe will give fashion a whole new mission,and build a platform for discussion and engagements of sustainable fashion. More institutions and brands across the world can be involved,contributing to the achievements of sustainable development goals. 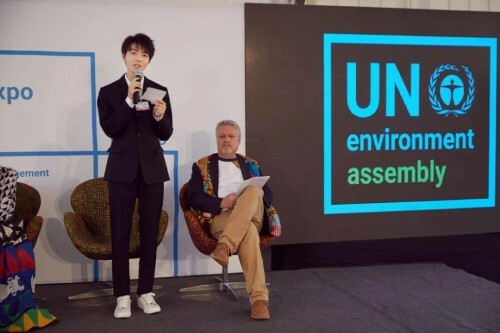 Now I ask you,please stand up with me to advocate for and support sustainable fashion, and secure a better sustainable future for people and our planet. First,I would like to thank all speakers and panelists for the enlighting speeches. 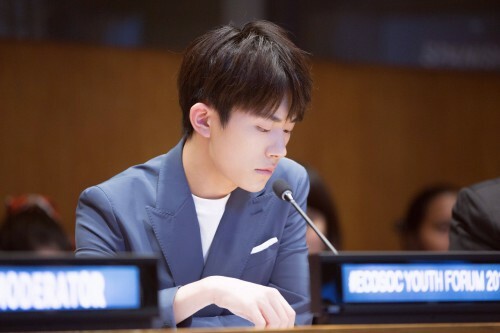 My name is Roy Wang.I’m a young singer and actor from China,the country that hosts 278 million young people,and the second largest youth population in the world. Until yesterday,I only saw the UN building on TV.so,this is the very first time that I am honored to participate in the youth forum to raise my voice. 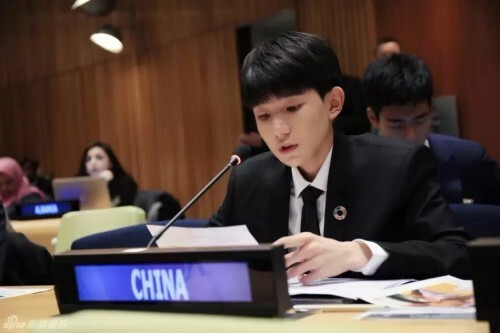 I’m grateful for this unique opportunity.I was fortunate to work with the United Nations China sub-group on use to advocate for the image 2030 Campaign,which aims at encouraging the young generation in China to reflect and think about the world we want to see in 2030. The year,the Sustainable Development Goals are expected be achieved. This campaign,meaningfully engaged a large number of young people,including millions of left-behind children,and other marginalized young people,and provided them with an opportunity to express their views and share their imagination to inspire our world. I submitted a cartoon-drawing project.My passion for 2030 is that every young person can access good quality education,girls have the same potential to achieve amazing things as boys. With the support from many young people across the country,the campaign,which has been running for a few months since October 26th,recorded over 500 million views online.Exported by a campaign,understanding SDGs has become a fashion among the young people. 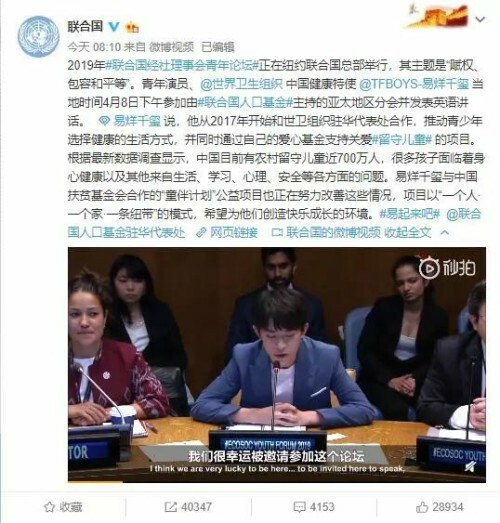 Dear excellencies,friends,and colleagues,taking this opportunity,both as a leader and a young person myself,I want to reassure you of Chinese young people's motivation to advance and realize SDGs wherever you are.I truly believe that our youth power can influence the world we live in,and hope that our determination can make a difference.